Summer at Ticonderoga Farms is a big growing season. In addition to the bamboo and figs, they have a large pick-your-own garden as well as a community garden that has been filled by many people from the surrounding area. You can drive out to the farm to pick sweet peppers, chilies, tomatoes, watermelon, corn, and some gorgeous sunflowers. They also sell their award-winning organic honey and organic free-range eggs, as well as their bamboo in various sizes, all at their market entrance. The community garden has many different kinds of vegetables, including corn, tomatoes, sweet peppers, chilies, greens, squash, chard, kale, basil, and other herbs. Each garden plot is unique, planted with a wide variety of vegetables and extra touches that reveal the personality of the gardener. Some of the gardens include flowers among the vegetables, decorative rock layouts, signs, and garden ornaments. Plots open in the spring, so check their website for more information. 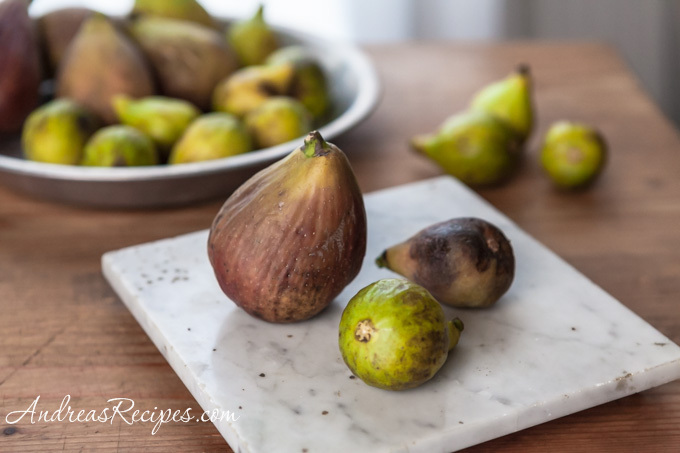 Figs are one of the most beautiful fruits in the world and make any dish more special. During my last visit I purchased a couple pounds of their Golden and Brown Turkey figs. The figs were soft and ripe, juicy and sweet, and they smelled heavenly. My boys were very excited, especially Top Gun who loves eating fresh figs. 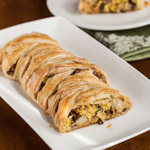 After fending off the scavengers in the kitchen, I made a savory/sweet appetizer that can be whipped up in a matter of minutes. Just about any kind of fresh fig will work with this appetizer. I roasted the figs with white balsamic vinegar from Trader Joe’s because it has a lighter flavor compared to dark balsamic vinegar. The tangy goat cheese pairs well with the savory sweet figs, and I top it all off with just a kiss of Ticonderoga Farms honey. We ate one, then two, then three, then had to stop ourselves. Figs can be addictive. Place the figs cut side down on the prepared quiche pan/baking dish and drizzle the balsamic vinegar over the figs. 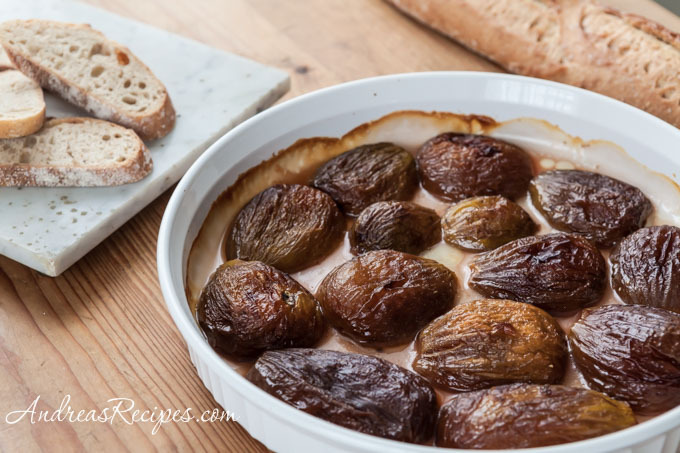 Roast in the oven until the figs are caramelized and soft, not mushy, about 15 minutes. 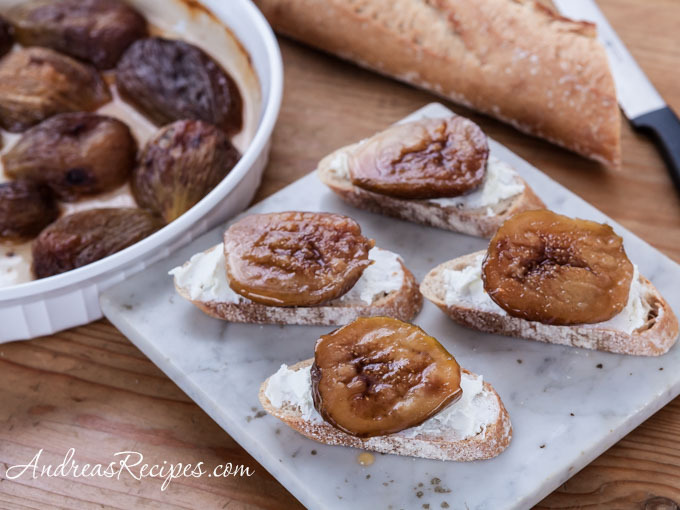 Spread goat cheese on each baguette slice and add a fig half. Put a few drops of honey on each fig and serve. 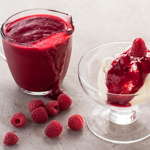 With our fig groves ready to begin delivering the annual fig harvest we crave we just had to dig up this great recipe. Thank you Andrea! Wonderful! I am looking forward to more figs from Ticonderoga!